Dial M for Murder, which Alfred Hitchcock adapted with precision from a hit play by writer Frederick Knott, was not a film the director particularly liked. In his famed conversations with Francois Truffaut, Hitchcock points to the film of an example of his “coasting,” and the dialogue quickly moves on to his later masterpieces. Hitch is right to believe that Dial M for Murder isn’t a match for his later, vertiginously towering achievements — but as an example of coasting, a director could do much worse. Hitchcock uses his camera to turn Knott’s play into a claustrophobic and dynamic experience, all without substantially altering its text or undermining its inherent theatricality. The director displays a subtle mastery, eschewing ambitious set pieces and instead offering a quietly imaginative rendering of one British apartment. Hitchcock benefits from an outstanding cast of actors who bring his purposefully-restricted production to life. Ray Milland stars as Tony Wendice, an upper-crust snob who discovers that his wife, Margot (Grace Kelly), has been cheating on him with an American writer named Mark Halliday (Robert Cummings). As recompense and a way to inherit her fortune, Tony arranges to have an old college buddy murder Margot — a plan which (unsurprisingly) goes haywire, and then leaves Tony attempting to frame his wife for murder. These actors appear uniquely suited for their roles. Milland is effectively smarmy and terrifying as Tony, a man who probably imagines himself to be smarter than he actually is, but might actually be just smart enough to pull off his plan. Kelly, an actress who is seemingly impossible to mention without the breathless and clichéd assessment of her stunning looks, is plucky and sympathetic as Margot. Cummings delivers the most naturalistic performance in the film, which contributes to our desire for him to ultimately save Margot; his love for her seems deep and abiding, and next to the calculating, smug Tony, Halliday brims with humanity. Hitchcock keeps actors in motion while they converse in the apartment, and completely permeates the space with his camera. He shoots from the floor and the ceiling and everywhere in between, giving us a glimpse of all four walls as they close in on Tony. Famously, the director had pits dug into the set so that he could film with the lens at floor level — a feat that comes in handy in the film’s most striking, gruesome shot, which punctuates the attempt on Margot’s life. It’s true that Hitchcock’s adaptation is devout, and it essentially preserves the play; if action took place off-stage, it similarly took place off-screen in the film. It’s also true that Hitchcock viewed the essentially single-set Dial M for Murder not just as a way to finish his contract with Warner Bros., but as one more technical challenge to overcome. By preserving Knott’s play, the director offers a pure display of the power of a camera, ratcheting suspense through sly editing and demonstrative camera angles. Notably, Dial M for Murder isn’t technically a Hitchcock-ian “whodunit” — we know whodunit. Instead, intrigue derives simply from how and if the odious Wendice is going to be caught, and as the film nears its conclusion, only Hitchcock’s canny mise-en-scene hints at just what might occur. 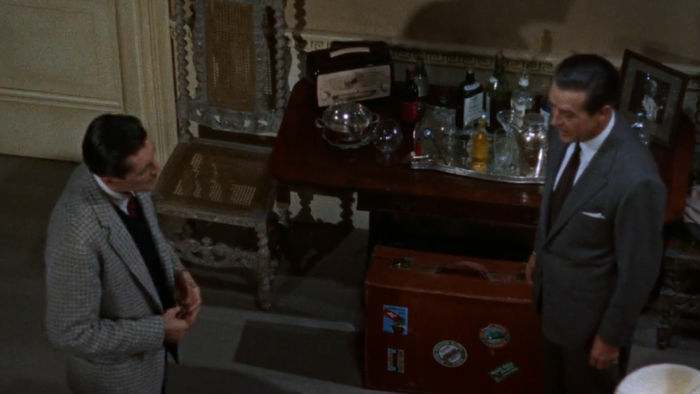 The director’s wry sense of humor is at play as well; numerous close-ups of keys and locks are eventually the key to unlocking the film’s central mystery. Hitchcock was far from burned out of course, despite Dial M for Murder coming as his 45th film. The director would go still go on to film Rear Window, Vertigo, North by North West, Psycho, and other films which probably contribute to overshadowing this one. 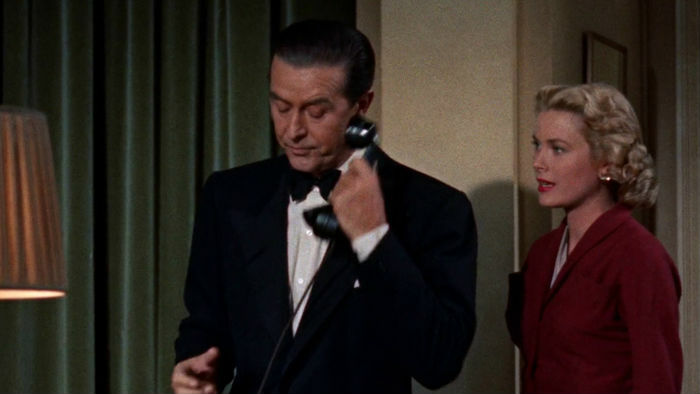 But Dial M for Murder (which, it should be noted, the director filmed — tastefully! — in 3-D during Hollywood’s first 3-D trend) deserves a place in the conversation with the rest of Hitchcock’s zenith. It bridges the gap between the director’s most notable technical exercises, Lifeboat and Rope, as well as his crowning achievements.